Water covers 70 percent of the earth’s surface. That’s a lot of water. Only 2.5 percent of that is fresh water and 98 percent of all fresh water is frozen in ice caps, glaciers or underground. Humans use 15 percent of the earth’s fresh water, 70 percent for agriculture, 20 percent for industry and 10 percent for household use. Nearly 800 million people in the world do not have access to clean water and 3.4 million people, many of them children, die from water related illnesses every year. Most of these people are poor and live in countries too impoverished by economic exploitation and war for their governments to provide the infrastructure needed to provide clean water. Clean water has been on my mind lately. One of the main purposes of my recent trip to Haiti was to improve the water quality from the well dug next to the church in January. At least half of the people in Haiti do not have access to clean water. There are very few public water treatment facilities in the whole country and none in rural communities like Pasquette. Even in cities it is not recommended to drink water from the tap. 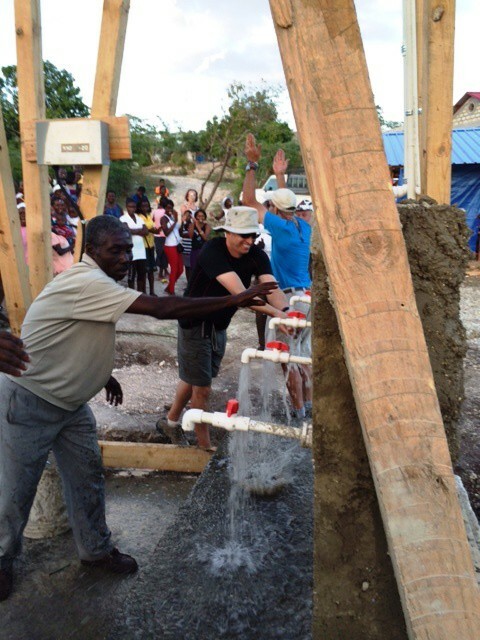 Our friends in Pasquette on Haiti’s southwest coast had put clean water at the top of their list of projects they wanted help with. Seeds of Support was successful in getting a well driller to dig more than 300 feet through the sandstone rock and gravel to a plentiful source of water. We needed to pump water from the well for several days and then take new samples to be sure the water is useable. My sister-in-law and brother-in-law who teach in China are home for a visit. Since water is on my mind, I asked them if the water in China was clean. Their response was that while many people have access to fresh water, very little of it is clean enough to drink and must be boiled before it is consumed. Those of us who live in the US and in Europe often take for granted our ability to turn on the tap, to take a drink, to rinse our toothbrushes, to shower, to wash dishes and to do laundry. We start whining and complaining when our water department puts restrictions on how much and how frequently we can wash our cars and water our lawns, all with clean, treated, potable water. In most countries where the tap water is clean enough to drink, it is the result of government regulations and water quality standards. Most large scale water treatment facilities and distribution systems are funded by tax dollars. It has not always been that way. As recently as the 1900’s, the occurrence of typhoid fever in the United States was approximately 100 cases per 100,000 people. By 1920, it had decreased to 33.8 cases per 100,000 people. In 2006, it had decreased to 0.1 cases per 100,000 people (only 353 cases) with approximately 75% occurring among international travelers. The near elimination of typhoid as a cause of death in this country is the result of public health education, water treatment facilities and improved sanitation. These are not merely numbers to my family. In 1905 my paternal grandfather died of typhoid fever. My dad was seven years old. His sister, the oldest of the nine children my grandmother was left to raise, was 14 and the youngest sister was six weeks old. We are so lucky that we have the water that runs out of the tap, ready to drink and to live in a country where that has been a priority of our local, state and national government. Don’t waste it. This entry was posted in From the Cavalier County Republican and tagged cholera, clean water, clean water standards, Fresh water, government regulation, public health, sanitation, tap water, typhoid, waste, water borne diseases, water purification on August 16, 2014 by janetjacobson.